This book is terribly sad, hopeful, and poignant. I’m not going to be able to give this book the time it deserves. It’s late. I walked in our school’s graduation this evening, and then I went out with a few friends/colleagues for dinner after, and while we did discuss this fantastic book at dinner, the night still leaves me here exhausted and running out of time. I promise that I will hit this one again early in my next 365 journey though! 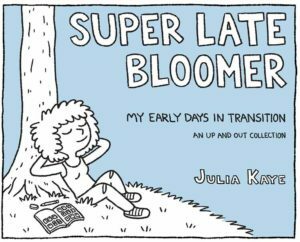 Super Late Bloomer is a series of short comic strips created by Julia Kaye as she began her gender transition in 2016. The book spans from four months into the journey (May, 7th, 2016) and goes until Halloween of the same year. And Kaye’s transition is powerful. She brings us the joyous moments, the terrifying moments, and all that falls in between. I can safely say that this book is in the top 5 of the year in books that made me feel something. 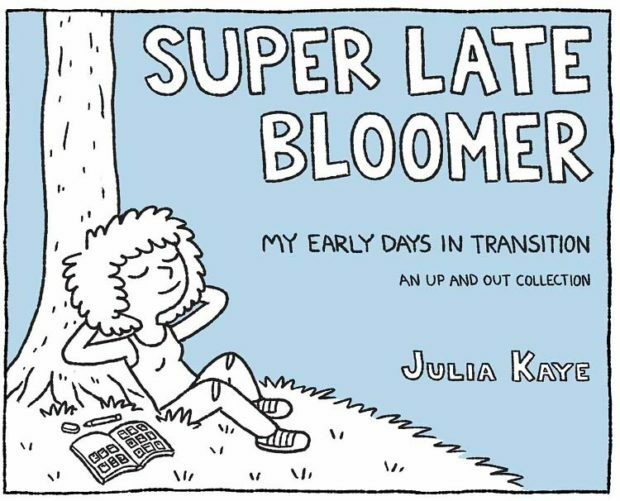 The struggle of Julia Kaye to become what she truly feels is herself is one that I have never really contemplated until this book. I am a straight, cisgender, white male. I am very liberal. I can’t understand why people can’t be cool with each other on the topic of sexuality. But all of my “I am” and “I can’s” don’t matter when people are honestly struggling with something as emotionally dynamic as changing gender and the public perception that comes along with it. I mean, sure, my support matters, but there is so much non-support that I feel fairly helpless in the situation. I think Julia Kaye is extremely brave. She is brave to quest to become what she wants to become; finding our calling is often intimidating as hell. She is brave in writing this comic, exposing her fears and successes; some people will not find this comic inspiring…they will find it weird. But for those of us that have a better understanding of what it means to be something other than cisgender, and more importantly, for those going through the same struggles that Kaye has, this book is love; this book is hope; this book is important. I do want to get into it more, but like I said: I will. And actually, I’m fairly happy with what I’ve written here. I already have three friends lined up to read this masterpiece from word of mouth, and I’m sure copies will make it into our school next year. Did I mention that this book is powerful? Oh! And the art is simple, so this book might inspire others to document similar journeys in their own drawings!